Box cameras are the earliest class of camera type, originating in the 19th century and later evolving into simple rollfilm models which remained popular as cameras for beginners until the 1960s. Box cameras are the oldest class of photographic cameras. 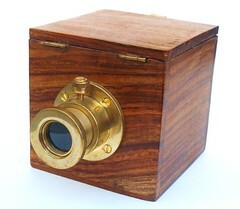 The first camera ever used for making persistent photographic images was the big wooden box camera that Nicéphore Niépce used for experimental photography in the mid-1820s. When Louis Jacques Mandé Daguerre joined his developments of new photographic processes they already used box cameras with iris diaphragm. Daguerre gave Niépce such a camera. Concerning lenses they had different preferences, Daguerre liked the color corrected (achromatic) version of the periscopic lens of optician-engineer Dr. Wollaston, Niépce sought the help of the opticians Vincent and Charles Chevalier. Some years later William Henry Fox Talbot made his photographic experiments. He had a whole series of little box cameras ("mousetraps") to be able to make several exposures on one sunny day - exposure times were very long in those pioneering days. The box design of all these pioneer cameras was derived from a certain variant of the camera obscura. When Daguerre could present a photographic process with acceptable exposure times in 1839 he made plans for a very heavy wooden box camera that became the model for many early photographic cameras: A box with an open back, and a hole in the middle of the front to mount a lens or a diaphragm and a lens. Shutters were not needed, the lens cap was sufficient. A second box, one with open front side, held in its back the light sensitive plate in its holder, or the focusing ground glass instead. The second box had to be pushed like a drawer into the outer box. Focusing was made with open lens, wide aperture and ground glass in the back by shifting the inner box for- or backward until the image subject appeared sharply on the screen. Since the sliding drawer should not hang in its position the bottom plate of the outer box was of double length so that the inner box was always moved on this plane. Alphonse Giroux was the maker of the biggest series of Daguerre's original camera "Le Daguerreotype", some made of fine walnut wood. He used achromatic lenses of the optician Charles Chevalier. Optician Bianchi produced a similar camera, probably with own lenses but the woodwork done by the same craftsmen that made Giroux's cameras. It's supposed that the Susse brothers made a small series of "Le Daguerreotype" too. In 2007 such a camera appeared for the first time in a photographica auction. 168 years after the production of the original camera the successful bidder must have a strong belief in its authenticity. Other early makers of sliding box cameras for the daguerreotype or the talbotype process were Gaudin & Lerebours (F), James Ottevill (GB) and John Roberts (USA) as well as many unknown craftsmen of the 1840s. Even at the beginning, amateurs participated in the photography business, at least as customers for photographic material. But traveling was expensive, and camera equipment was heavy, so that a camera was not in the luggage of even many rich travelers. But by the end of the 19th century, circumstances were changing. Dry plates, roll film, drugstores with darkrooms to rent, material and infrastructure were emerging to support a spreading of amateur photography. And traveling was becoming easy and affordable since the railway networks reached a high density and trains were much faster. The industry had to invent easy-to-use cameras for all the new potential camera buyers. Box cameras were one key product in that market. They contained a simple camera technology, the best for mass production. And they offered the convenience of making a whole series of photos without reloading. In 1888 the Kodak Camera with built-in 100-exposure paper film roll was only the first of many rollfilm box cameras that appeared on the market. With clever marketing and advertising the cameras found more and more customers. But the film plates and sheet film got a chance on that market through another type of box camera, the magazine camera. 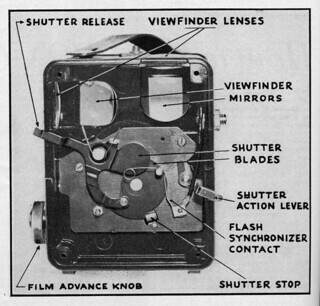 The related camera makers produced several ingenious plate change mechanisms. The magazine box cameras eventually vanished by the 1920s. In 1896 Zar made the first very cheap entry-level box camera. In 1900, a Yale plate box camera cost just $2, including a complete developing/printing/toning kit. The box cameras for single film plates were soon eclipsed by Kodak's 1900 introduction of a $1 box camera for roll film, the first Brownie. This concept of an affordable, simple camera was what brought photography to a mass market. Another new marketing theme arose when the international boy scout movement was launched. Many Camera makers then offered "Scout" models: Seneca, Pho-Tak, Kodak, Lumière, Imperial. When Kodak celebrated its 50th jubilee it even gave box cameras to 550.000 American pupils. In Germany Agfa launched a campaign in the 1930s. People could buy an Agfa Box 44 camera for 4 marks, below the production price. Agfa recuperated the loss via film sales. 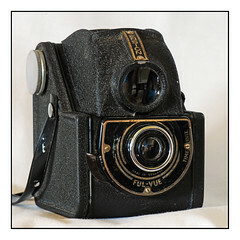 The 1946 redesign of the Ensign Ful-Vue was a new approach to box camera design, with a handsome and with a very big viewfinder. New developments in plastics molding, such as bakelite, meant manufacturers were no longer limited to the old rectilinear shape: fanciful styling could help add eye appeal in what was becoming a mass consumer product. The term "box camera" was evolving, and by the 1950s meant any simple, rigid-bodied amateur camera lacking much in the way of exposure or focus adjustments.. But box cameras continued their role as approachable "starter" cameras, aimed at those lacking the money or technical understanding to buy more complicated models. A special category among the box cameras is the pseudo TLR. The Rolleiflex and other twin-lens reflex cameras had become widely-admired—and in fact, imitations of it were a major segment of 1950s Japanese camera manufacture. But thanks to inexpensive bakelite moldings, for a few dollars any amateur could walk around with something looking similar. The difference versus a real twin lens reflex camera is that the top lens is only a cheap brilliant finder, and the whole reflex focusing concept is dropped in favor of fixed focus lenses. Despite the pseudo TLRs' often poor image quality they were the industry's way to lure many consumers. 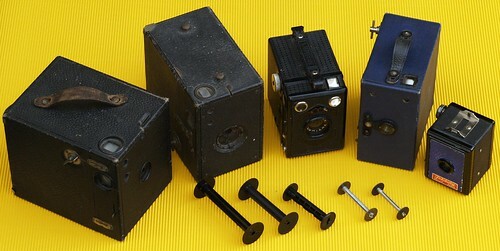 The rollfilm boxes stayed popular as beginners' cameras until the 1950s, some plastic models even until the 1960s. The decline of the classic box camera began in 1963 when Kodak introduced its drop-in 126 film cartridge, as film loading had remained one complication that frequently stumped beginners. Its Instamatic cameras were a runaway sales success, and amateur roll-film box cameras went into steep decline. But most Instamatics remained box cameras in spirit as the most popular models remained just as non-adjustable as the earlier cameras had been. 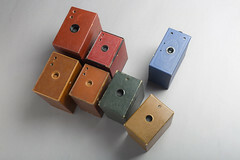 Today, a few varnished-wood pinhole box cameras for sheet film are available, echoing back to the very earliest box cameras made. The lasting success of the cheap plate and rollfilm box cameras is that they helped to make photography an easily affordable pastime for everybody. Some of the late bakelite and plastic models had a built-in flash for flashbulbs, thus looking forward to modern compact cameras. The lasting success of box cameras lives on in the many photographs taken with them from 1896 (the first very cheap box camera) to the 1960s, priceless images which fill many old family albums. Box-shaped cameras with more advanced mechanism like the early instant camera Appareil Dubroni No 1 or old semi-folding SLR cameras or real TLR cameras are not classified as box cameras. The class of box cameras is defined by simpler camera construction and limited controls. However, one remarkable maker must be mentioned here: Charles Louis Chevalier who was the first successful maker of collapsible box cameras, a camera type between box and folder, later improved by other makers. This page was last edited on 22 January 2019, at 09:25.